Coloring your way to calm is a fantastic new way for adults to beat stress. These inspiring designs are both beautiful and unique. The projects range from simple to complex projects, and each can take your focus away from the rush and running of everyday life. Grab your colored pencils, markers, or brushes and start on the road to a less stressful life! 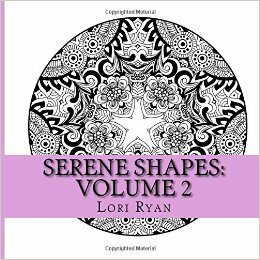 Lori Ryan is a NY Times and USA Today bestselling author or romance and romantic suspense. She's an expert at building tension in her fictional worlds. Now she's decreasing tension through the use of art, patterns, and shapes! This book contains 42 images printed on one side of the page only. It contains an extra wide inside margin to allow for easier removal of the pages for coloring.